Evaluation of Genotoxicity of 4-n-Nonylphenol using Vicia faba L.
The present investigation dealt with the effects of 4-n-nonylphenol (NP) on the mitotic and meiotic division of Vicia faba L. Root-tips of Vicia faba was treated with a series of NP concentrations ranging from 25, 50 and 100 ppm for 3 and 6 h. The 4-n-nonylphenol (NP) concentrations used, generally had a marked metodepressive effect on Mitotic Index (MI) after all concentrations at 3 and 6 h except 25 ppm for 3 h. Spraying of Vicia faba flower buds with 25, 50, and 100 ppm of NP for 1, 2, 3 and 4 successive days were capable to induce positive results of abnormal Pollen Mother Cells (PMCs.). The 4-n-nonylphenol (100 ppm) caused killing 40% of flower buds. Several types of abnormalities were observed after all treatments in both mitotic and meiotic divisions. These types of abnormalities were: chromosome stickiness, disturbed chromosomes, ana-telophases bridges and lagging chromosomes. The 4-n-nonylphenol was induced change in esterase isoenzyme. F.I.M. Adam and Z.M. El-Ashry, 2010. Evaluation of Genotoxicity of 4-n-Nonylphenol using Vicia faba L.. Journal of Biological Sciences, 10: 368-372. With the escalation of industrial processes and the expansion of urban population, a vast amount of organic pollutants in industrial wastes, reside pesticides and sewage have been released into the environment. Organic pollutants affected on ecological and human being health. The pesticides workers uses nonylphenol and the related nonylphenol ethoxylates in pesticides products as inert ingredients and adjuvant added. 4-n-nonylphenol (NP) is an important class of nonionic surfactants employed in many detergent formulations for industrial and household use. Steurbaut et al. (1989) recorded that nonylphenol surfactants plays an important role in the penetration and transport process at the different barriers of the plant. They cause sever cell membrane disruption and the rely influence the penetration of fungicides into the plants. NP has toxic effects on aquatic animals and plants. Also, 4-n-nonylphenol contaminated of crop plants and affected the quality of food or feedstuff (Bokern et al., 1998; Höss et al., 2002; Hense et al., 2003; Wang et al., 2007). Soto et al. (1991) showed that estrogen-like activity of NP was observed in vitro. The NP induced both cell proliferation and progesterone receptor in human estrogen-sensitive MCF7 breast tumor cells and it triggered mitotic activity in rat endometrium (White et al., 1994). Karley et al. (1997) found that ATP content was reduced and glucose induced extracellular acidification was inhibited only by NP. The purpose of this study was to investigate the genotoxic effects of 4-n-Np that occurred on the mitotic, meiotic divisions, chromosomal behavior and esterase isoenzyme of Vicia faba plants. Seeds of Vicia faba L. (var. Giza 2) were used in the present study. The seeds were kindly supplied by the Legume Research Section, Agricultural Research Centre, Giza, Egypt. The concentrations of NP ranging from 25, 50 and 100 ppm were used for mitotic and meiotic studies. 4-n-nonylphenol was purchased from fluka: Seeds of Vicia faba (Giza 2) were germinated in filter paper moistened with tap water. When the roots reached 1.5- 3.0 cm in length, the roots were exposed to different concentrations of 4-n-NP for 3 and 6 h. The control roots were exposed to distilled water. The roots were cut off after treatments and then fixed in 3 absolute ethyl alcohol: 1 glacial acetic acid (v/v) for 24 h. All cytological observations were made on permanent root-tip squash preparations which were stained with Feulgen (Sharma and Sharma, 1980). Vicia faba plants were sprayed at the flowering stage with three concentrations of 4-n-NP 25, 50 and 100 ppm for 1, 2, 3 and 4 successive days for each concentration. Control plants were sprayed with distilled water. Flower buds were gathered after 24 h. Then, immediately fixed in 3 absolute ethyl alcohol: 1 glacial acetic acid (v/v) and then, examined using the aceto-carmine smear method. Abnormalities were counted in the first and second meiotic division. The isozymes tested in this study were esterase which was clearly observed when separated in poly acrylamide gel. 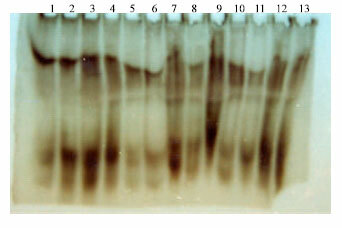 Extraction gel preparation electrophoresis, staining and distaining followed the procedure of Stegmann et al. (1980) and Jonathan and Wendel (1990). All cytological data were reported as mean values and Standard Error (SE) of the mean. SPSS computer software was used to estimate the t-test for significance at p≤0.05 and p≤0.01 level. The Mitotic Index (MI) reflects the frequency of cell division and is regarded as an important in evaluating the rate of root growth. The data in Table 1 clear that NP induced mitodepressive effect on cell division of Vicia faba root cell as compared with the control. The mitotic index was generally reduced in the treated roots with the different concentrations of NP treatment after 3 and 6 h. The mitotic index values were progressively decreased as the concentrations and duration of treatments were increased. The lowest value mitotic index was recorded after 6 h with (100 ppm) which reached 7.98±0.29 as compared to control 10.30±0.69. Bokern and Harms (1997) found that the concentrations of 4-NP from 0.05-1.00 mM was toxic to 14 different plant cell suspension cultures. These concentrations caused 50% growth reduction. The lowest concentration 25 ppm had no effect on MI after treatment for 3 h, but after treatment for 6 h had a significant effect was occurred. The reduction in mitotic activity can be explained on the basis of interphase duration increase due to inhibition of DNA synthesis and increase in G1 phase duration (Keul and Keul, 1984). These results resemble those obtained by Liu et al. (2003), who reported that the mitotic index of Vicia faba root tips were successively decreased and even stopped with the increase of trichlorobenzen concentrations and duration of treatment. The inhibition of mitotic activity has been regarded as a common effect by numerous of chemical compounds and has been reported by many investigators as: Maleic hydrazide on Allium cepa (Marcano et al., 2004), municipal landfill leachate on Vicia faba (Sang and Li, 2004), tannery soil waste on Vicia faba (Chandra et al., 2004) and food preservative chemical on Allium cepa and Vicia faba (Abd-El-Hady and Barakat, 2005). The NP induced a wide rang of mitotic abnormalities. Their frequencies increased as the concentrations of NP and duration of treatment increased. The maximum percentage reached to 3.33±0.14 with the highest concentration of NP compared with the control 0.95±1.03 for 6 h (Table 1). Spraying the flower buds of Vicia faba plants with different concentrations of Np solution led to the induction of a significant percentage of total abnormal PMCs (Table 2). This percentage increased with increasing the concentration of NP and duration of treatment. The maximum value of meiotic abnormalities was recorded after spraying the flowering buds with 100 ppm for four days 3.72±0.47, as while low dose 25 ppm for 4 days was 1.75±0.39 compared to the control 0.50±0.06. The NP caused a killing 40% of buds with 100 ppm after 6 days. The NP had a toxic effect on the buds of Vicia faba plants. The same results recorded by Cox (1996), who found that a high concentration of nonyphenol exthoxylate caused a delay in bud break and up to 50% bud kill in apples, peaches and grapes. Many authors working on the mutagenic effect of different chemicals on the plant cells have reported the same results as: (Monarca et al., 2003) chlorobenzene, acid rain and Cd2+ on Vicia faba (Liu et al., 2003, 2004) and municipal landfill leachate on Vicia faba (Sang and Li, 2004). The frequency of abnormalities in the first meiotic division was higher than that recorded in the second meiotic division, after 100 ppm NP treatment. The same results was observed by benomyl on Pisum sativum (Amer et al., 1999) and cascade on Vicia faba (El-Sherbeny et al., 2002). Furthermore, the results showed a highly significant increase in the percentage of total mitotic and meiotic abnormalities due to treated of Vicia faba with 50, 100 ppm of NP at different period of treatment (Table 1, 2). The pattern of increase in frequency of chromosomal abnormalities with increase the concentration and period of treated was closely related to the decrease of division rat. Several types of chromosomal aberrations in mitotic and meiotic division were: Chromosomes Stickiness, disturbed chromosomes, bridges and lagging chromosomes. These types of aberration were observed after treatment with all concentrations of NP (Table 1, 2 and Fig. 1a-d). Chromosome stickiness and disturbed configuration were the most common types of abnormalities (Table 1, 2). 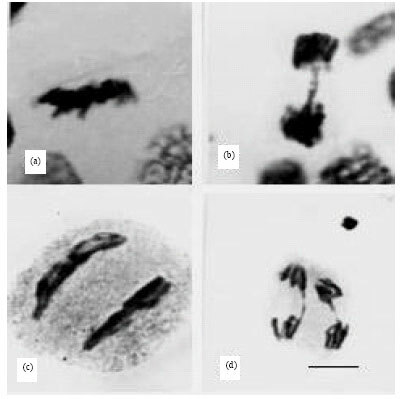 Stickiness of chromosomes was observed in the different stages (Fig. 1). The occurrence of such phenomenon in other chemically treated plants, is thoroughly reviewed elsewhere, Jayabalan and Rao (1987) suggested that stickiness at meiosis was due to the disturbance in cytochemically balanced reactions. Chromosome stickiness may result from entanglement of chromatin fibers, which fall to condense properly in preparation for cell division (Abd-El-Salam et al., 1996; El-Ashry and Shalaby, 2001). The highest percentage of ana-telophase bridges (Fig. 1c) was induced after treatment with the highest concentration of NP. Formation of bridges can be interpreted on the basis of the general stickiness of chromosomes and subsequent failure of anaphase separation (Gottschalk and Wolf, 1993). Lagging chromosomes observed in a considerable percentage in the different mitotic and meiotic stages after treatment with all concentrations of NP (Fig. 1d). This induction of lagging chromosomes due to delayed termination of chromosome end or because of failure of chromosomal movement and attributed to the spindle apparatus (Patil and Bhat, 1992; El-Ashry, 2003). Esterase isozyme result indicated that 4-n-nonylphenol a had a mutagenic effect on the genetic background of the isozyme for Vicia faba plants. Migration of esterase isozyme exhibited a maximum number of four bands with different densities and intensities as shown in Fig. 2. It was noted that esterase isozyme band number 2 was absent in the control (lane 1) and in 25 ppm NP after one and two days (lane 2 and 3). This new band was appeared in 25 ppm after three and four days. Main while, the band number 2 was appeared after all treatments with 50 and 100 ppm NP (Table 3). In addition to the use of chromosomal aberration, which is considered as one of the most valid indicators of mutagenic potency (Mendhulka, 1993), the genotoxicity of NP have been measured by their ability to induce alterations in gene expression as shown in esterase isozyme. The appearance of new band may be explained on the basis of mutational event at the regulatory system of an unexpressed gene(s). This result was in agreement with the results obtained by Mohamed (2002). From the present study, it could be concluded that NP had a toxic and mutagenic effects by inducing wide rang of the cytological and active esterase isozyme in Vicia faba plants. Abd-El-Hady, E. and H. Barakat, 2005. Effects four food preservative chemicals on Chromosomal aberration, gene expression and DNA image during cell cycle in Allium cepa and Vicia faba plants. Egypt. J. Genet. Cytol., 34: 237-254. Abd-El-Salam, A.Z.E., H.Z. Hassan and K.H. Soliman, 1996. The mutagenecity of two aromatic systemic pesticides using three biological systems. Egypt. J. Genet. Cytol., 25: 171-184. Amer, S.M., F.I. Mohamed and Z.M. El-Ashry, 1999. Cytogentic effects of the fungicide benomyl on Vicia faba and Pisum sativum. Bull. NRC. Egypt, 24: 481-494. Bokern, M. P. Raid and H. Harms, 1998. Toxicity, uptake and metabolism of 4- nonylphenol in root cultures and intact of plants under septic and aseptic conditions. Enviorn. Sci. Pollu. Res., 5: 21-27. Bokern, M. and H. Harms, 1997. Toxicity and metabolism of 4-nonylphenol in Cell suspension culturesof different plant species. Environ. Sci. Technol., 31: 1849-1854. Chandra, S., L.K.S. Chauhan, P.N. Pande and S.K. Gupta, 2004. Cytogenetic effects of leachates from tannery solid waste on the somatic cells of Vicia faba. Environ. Toxicol., 19: 129-133. Cox, C., 1996. Nonylphenol and related chemicals. J. Pesticide Reform, 16: 15-20. El-Ashry, Z.M. and M.A.F. Shalaby, 2001. Physiological and cytological responses of chick PEA cultivars (Cicer arietinum L.) to cycocel. Ann. Agric. Soc., 39: 997-1009. El-Ashry, Z.M., 2003. Effects of vitamin A on phosphamidon-induced mutagenesis in Vicia faba L. Egypt. J. Genet. Cytol., 32: 303-316. El-Sherbeny, K.M., F.I. Mohamed and M.H. Abou-Deif, 2002. Genotoxic effect of insecticide cascade in mice and Vicia faba, Egypt. J. Genet. Cytol., 31: 135-150. Gottschalk, W. and G. Wolf, 1993. Induced Mutation in Plant Breeding: Monographs on Theoretical and Applied Genetics. Springer Verlag, Berlin, pp: 1-230. Hense, B.A., I. Juttner, G. Welzl, G.F. Severin, G. Pfister, A. Behechti and K.W. Schramm, 2003. Effects of 4-nonylphenol on phytoplankton and periphyton in aquatic microcosms. Enviorn. Toxicol. Chem., 22: 2727-2732. Hoss, I., W. Traunspurger, G.P. Fester, K. Schramm and C. Steinberg, 2002. Enhanced growth and reproduction of Caenorhabitis elegans (Nematoda) in the presence of 4-nonylphenol. Enviorn. Pollu., 120: 169-172. Jayabalan, N. and G.R. Rao, 1987. Gamma radiation induced cytological abnormalities in Lycopersicon esculentum Mill. var. pusa ruby. Cytologia, 52: 1-4. Jonathan, F.W. and N.F. Wendell, 1990. Visulization and Interpretation of Plant Isozymes. In: Isozymes in Plant Biology, Soltis, D.E. and P.S. Soltis (Eds.). Chamran and Holl, London, pp: 5-45. Karley, A., S. Powell and J. Daries, 1997. Effect of nonylphenol on growth of Neurospora crassa and Candida albicans. J. Applied Environ. Micro., 63: 1312-1317. Keul, L.G. and M. Keul, 1984. The effect of carbendazin on cell cycle in the root meristems of Triticum aestivum sp. Hordeum vulgare and Vicia faba. Rev. Roum. Boil. Ser. Biol. Veg., 28: 131-136. Liu, H., B. Liao and S. Lu, 2004. Toxicity of surfactant, acid rain and Cd2+ combined pollution to the nucleus of Vicia faba root tip cells. Ying Yong Sheng Tai Xue Bao, 15: 493-496. Liu, W., Q. Zhou, P. Li, T. Sun, H. Xu, C. Zhang and H. Zhang, 2003. [Effects of chlorobenzene stress on seedling growth and cell division of Vicia faba]. Yong Sheng Tai Xue Bao, 14: 585-588, (In Chinese). Marcano, L., I. Carruyo, A. Del Campo and X. Montiel, 2004. Cytotoxicity and mode of action of maleic hydrazide in root tips of Allium cepa L. Environ. Res., 94: 221-226. Mendhulka, V.D., 1993. Effect of chemical mutagens in Desmolium tortusoum. Ph.D. Thesis, Karnatak University, Dharwad India. Mohamed, F.I., 2002. Effects of vitamin C on lead acetate induced mutagenesis in Vicia faba L. Egypt. J. Genet. Cytol., 31: 105-119. Monarca, S., M. Rizzoni, B. Gustavino, C. Zani, A. Alberti, D. Feretti and I. Zerbini, 2003. Genotoxicity of surface water treated with different disinfectants using In situ plant tests. Environ. Mol. Mutagen., 41: 353-359. Patil, B.C. and G.I. Bhat, 1992. A comparative study of MH and EMS in the induction of chromosomal aberrations on lateral root meristem in Clitoria ternetea L.. Cytologia, 57: 259-264. Sang, N. and G. Li, 2004. Genotoxicity of municipal landfill leachate on root tips of Vicia faba. Mutation Res., 560: 159-165. Sharma, A.K. and A. Sharma, 1980. Chromosome Techniques. Fakenham Press Ltd., Fakenham, Norfolk, pp: 95-105. Soto, A.M., H. Justicia, J.W. Wray and C. Sonnenschein, 1991. p-nonylphenol: An estrogenic xenobiotic released from modified polystyrene. Environ. Health Perspect., 92: 167-173. Stegemann, H., A.E. Shehata and M. Hamza, 1980. Broad bean proteins (Vicia faba L.). electrophoretic studies on seeds of some German and Egyptian cultivars. Z. Acker Und Pflanzenbau, 149: 447-453. Steurbaut, W., G. Melkebeke, W. de Jonckheere, P. Chow, NP. Grant, A.M. Hinshalwood and E. Simundsson, 1989. The influence of Nonionic surfactants on the penetration and transport of systemic fungicdes in plants. Adjut. Agron. Chem., 1: 93-103. Wang, J., P. Xie and N. Guo, 2007. Effects of nonylphenol on the growth and Microcystin production of Microcystis strains. Envi. Res., 103: 70-78. White, R., S. Jobling, S.A. Hoare, J.P. Sumpter and M.G. Parker, 1994. Environmentally persistent alkylphenolic compounds are estrogenic. Endocrinolgy, 135: 175-182.